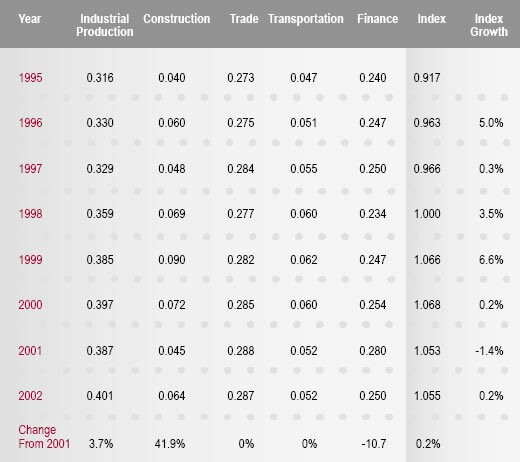 The Evansville economy was stalled for much of 2002, as measured by the index of economic activity maintained at the University of Evansville (see Table 1). Reaching a peak in 1999, it posted an inconsequential decrease in 2000, but fell by 3.4 percent in 2001. There were substantial gains in construction and in industrial production, but declines in trade and finance. Throughout 2002, the index remained at its 2001 level. The total value of new construction permits in Vanderburgh County = construction. With 1998 as the base year for the index, the raw data show industrial production at a record high between 1995 and 2002. Construction permits were up 43 percent over 2001, but have yet to regain their 1999 maximum. Recent changes in the way we use our airport may make comparisons with the transportation variable less informative. The trade and finance employment-based components have been recalculated this year to incorporate the new NAICS classification system. I am guardedly optimistic about our near-term future, based on the recent performance of the local labor market. Though we lost 2,900 jobs from 2002 to 2003, our unemployment rate (4.2 percent) is less than the state’s (5.0 percent), which is less than the nation’s (6.0 percent). As the national economy continues to recover, the local economy will likely continue its recovery. For our area to prosper in the long term, our workers must be able to compete successfully with workers all over the world. If not, they will lose either their wages or their jobs. Continuous improvement in worker productivity remains a managerial challenge. Should the recent defeat of the referendum to finance the schools signify a long-term lack of support for education in our community, I fear for our long-term success.